Zimbabwe: Mnangagwa Must Act, But Don't Give Up on Zimbabwe – Former Envoy Tells U.S. The government often shuts down the internet, denying people access social media. Many Zimbabweans fear another military takeover. Southern Africa's stability is at risk as impoverished citizens flee. 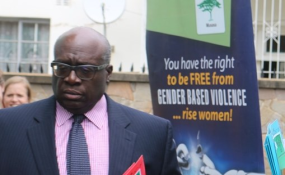 In an act reminiscent of the treatment of Dr. Martin Luther King, Jr. in the United States in the 1960s, the human rights activist, Pastor Evan Mawarire, has been unjustly jailed for calling for a non-violent strike, a basic human right which is legal under Zimbabwe's Constitution. Zimbabweans are savvy. They knew that the military forced Mugabe out to protect themselves, but placed hope in President Emmerson Mnangagwa's pledge to hold free and fair elections and rebuild the moribund economy. They held this hope despite his history of human rights violations, particularly the "Gukurahundi" genocide of the 1980s that claimed the lives of thousands of Ndebele people in southern and western Zimbabwe. But Mnangagwa and his advisors, including Central Bank Governor John Mangudya, have failed to institute much-needed reforms. Despite their marketing slogan "Zimbabwe is open for business", they have not stemmed the crony capitalism that has prevented local and international business people from investing. And even if sanctions were lifted, Zimbabwe remains in arrears to the World Bank. How can anyone expect new funding if previous loans remain unpaid and ignored? The government's financial advisors have stubbornly pegged Zimbabwean currency, known as "Bond Notes", at 1 to 1 to the U.S. dollar and they have manipulated Real Time Gross Settlement (RTGS), which allows for interbank electronic transfer. The consequences are that local bank transfers have turned into currency. Zimbabweans utilize RTGS to access mobile money. The resulting challenge is that Zimbabwe now has multiple currencies with different values, and importers must purchase goods with scarce hard currency but accept payment in one of the nation's electronic soft currencies. Hence shortages abound. But the government's violent reactions to peaceful protest will setback his initiatives, and unless and until the politicians and their cronies who benefit from corruption are brought to book and Mnangagwa introduces legislative reforms, Ncube's well-intentioned efforts are doomed. The international community is right to be wary of Zimbabwe's political leadership. But the United States must not give up on Zimbabwe and its talented people. The U.S. remains the leading bilateral and multilateral donor. Our current assistance combating HIV-Aids and cholera is successful, as have been past efforts to build educational institutions that have produced countless scholars. We must work with the international community to help Zimbabwe implement meaningful reforms that will attract investment. At the same time, Zimbabwe's government must become a willing partner. It needs to work with international financial institutions, the Southern African Development Community (SADC), the African Union (AU) and the United Nations to begin the long and arduous road to recovery. President Mnangagwa must live up to his promised "radical economic reforms" and bring laws in line with the Constitution – including the Public Order and Security Act and the Access to Information and Protection of Privacy Act that limits press freedom. He must implement meaningful land reform, including giving black farmers title to their land. And he must free Pastor Mawarire and re-open access to social media.